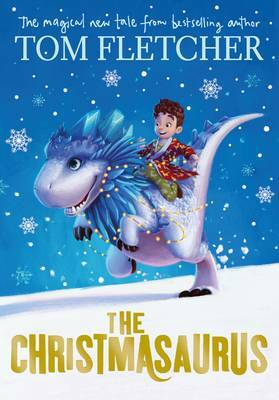 This book is about a boy called William and his dad, Bob Trundle and a very special Christmas dinosaur. William LOVES dinosaurs – he has dinosaur pyjamas, dinosaur socks, a dinosaur toothbrush, dinosaur wallpaper, two dinosaur posters, a dinosaur lampshade and lots and lots of dinosaur toys. However, all William wants for Christmas is a REAL dinosaur, even though he knows that it is impossible! Meanwhile in the North Pole, something magical is happening… Whilst the elves are mining, they come across a strangely large egg, so they take it to Santa. Santa doesn’t know what it is until Christmas Eve when it hatches! Santa calls it the Christmasaurus ; the Christmasaurus is the last ever living dinosaur. Willipoos’, (the name William’s dad calls him) life is brilliant UNTIL a new girl comes to school. Her name is Brenda Payne. We call her Brenda “Payne by name and pain by nature”. Brenda ruins William’s life until… William meets the Christmasaurus. How does the Christmasaurus get into William’s house? What’s Brenda’s next evil plan? You’ll have to read the book to find out. We give 5* and recommend it to 9+ or younger if reading it with a parent as it’s quite a long book. We also think it’s a good book to share in a classroom because it talks about friendship and you can also use it for Christmas themed activities.